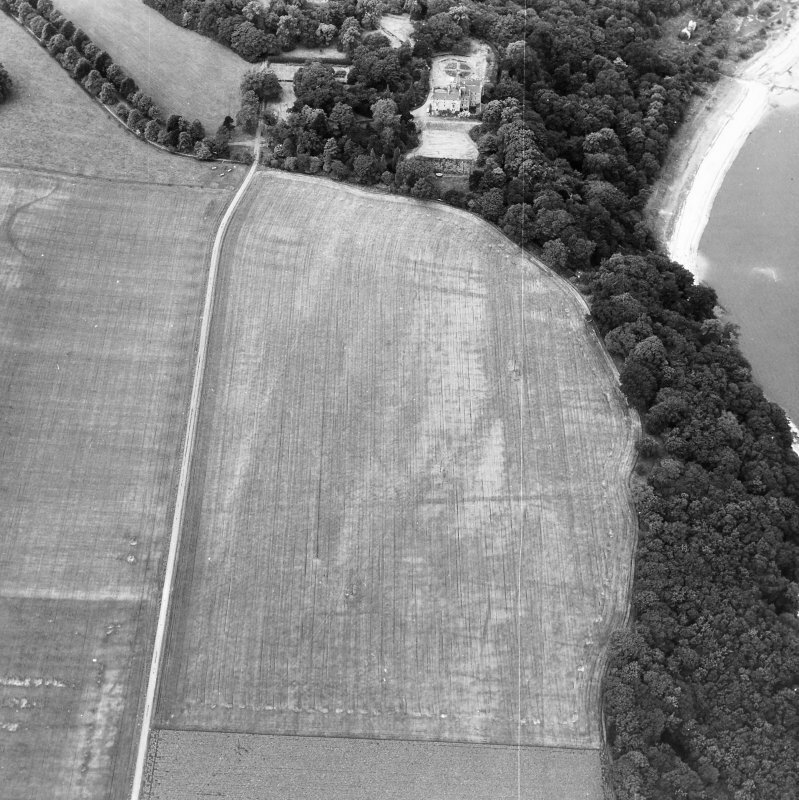 In 1945 a Roman fort at Carriden was observed on A Ps. 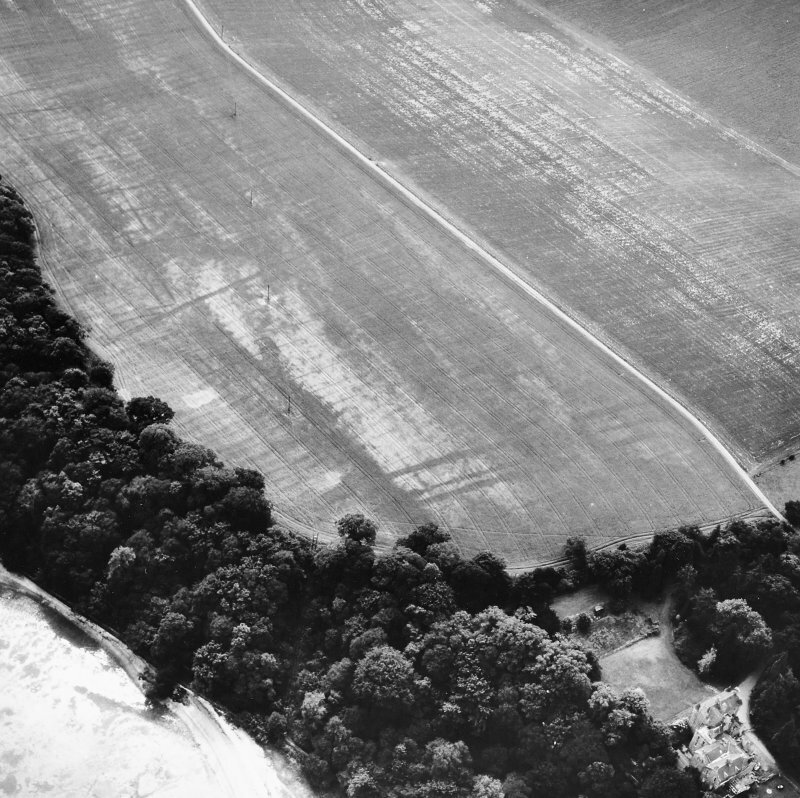 'In an arable field three parallel ditches, on a N-S alignment, mark the E side of the fort. They bend round to the W at their S end, and, rather less than halfway along their line from the S, there is an interrruption as if for a gate. 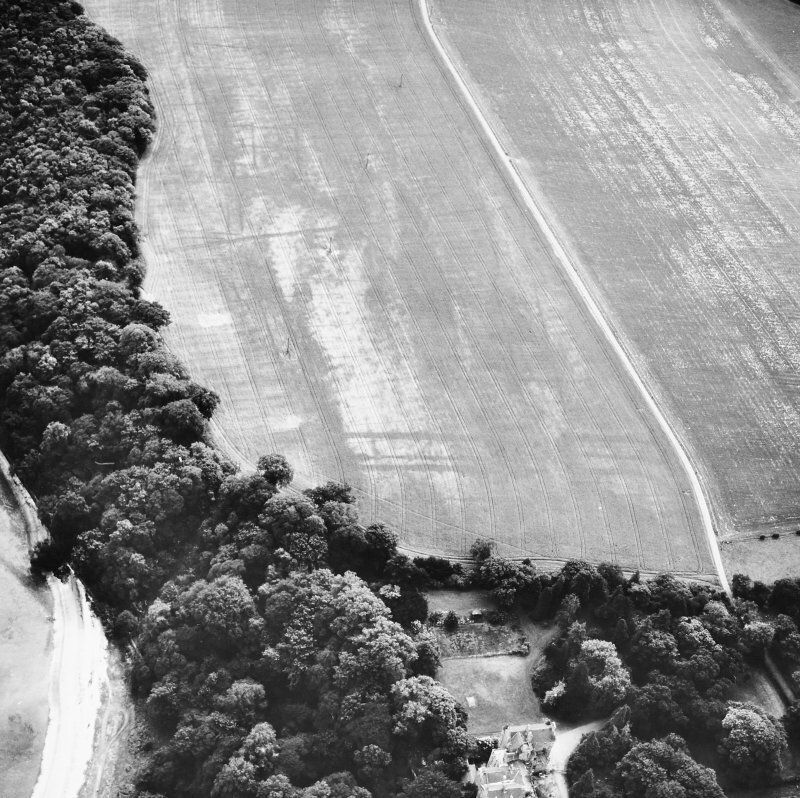 A visit to the site in September 1945 showed that no remains were to be seen on the surface, the fields and gardens which cover the site having removed all traces. 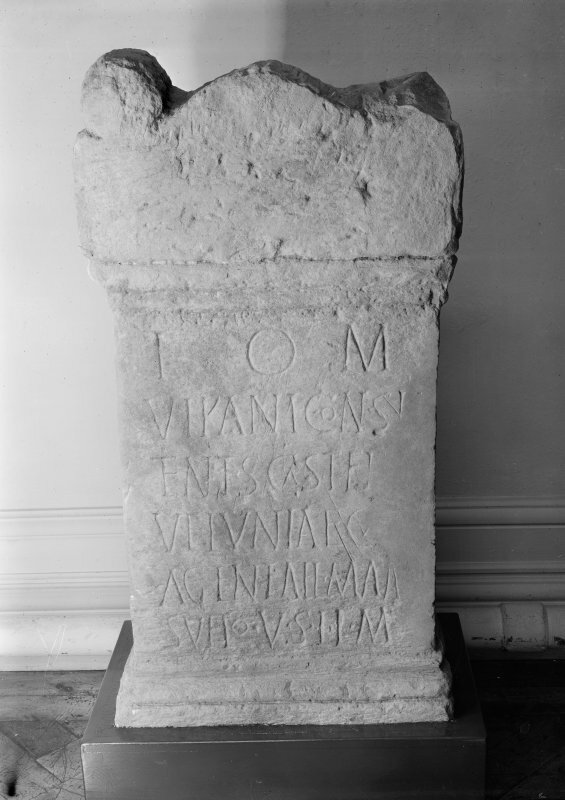 Roman altars, inscriptions, coins, and a gold medal of Vespasian are said to have been dug up at Carriden. A centurial stone, now disappeared, was built into the wall of Carriden House (G Macdonald 1901). J K St Joseph 1949; G Macdonald 1934; Proc Soc Antiq Scot 1949. 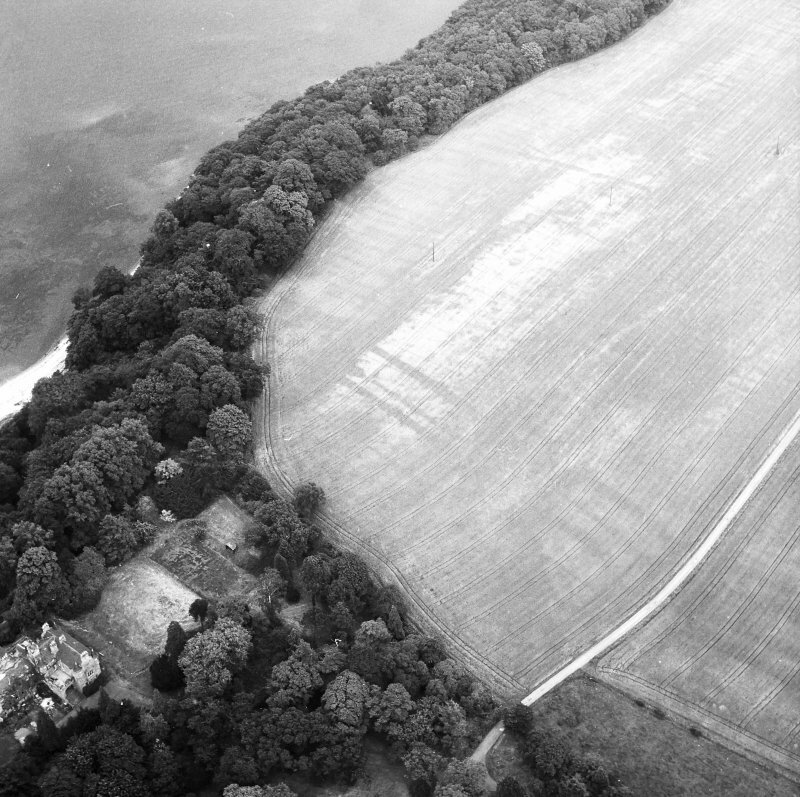 No trace of the Roman fort at Carriden is visible on the ground. The W part of the fort lies in the grounds of Carriden House and the site is occupied by ornamental gardens. The E part lies in a field under cultivation, and there are no surface indications of the structure. Visited by OS (D S) 24 January 1957. NT 025 808. Roman pottery, including Samian, and a sestertius of Hadrian dateable to 119 - 138 A D, was found during ploughing (E J Price 1972). 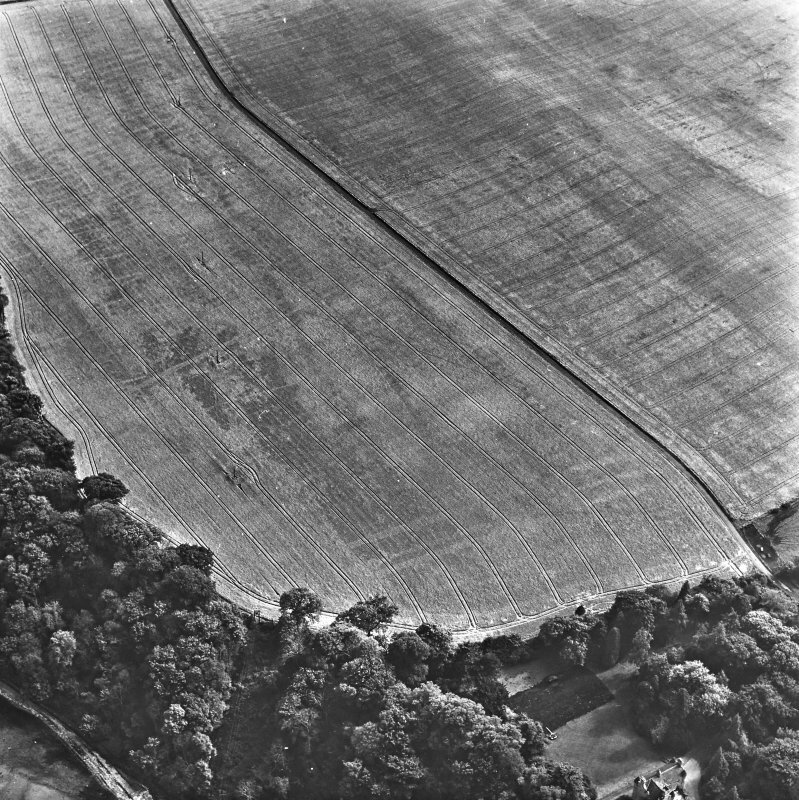 Mr Price has also discovered a stone-built water-course or aqueduct in a plantation NE of Carriden which he thinks may be Roman. E J Price 1972; Information in telephone call from E J Price and E C Waight 27 July 1972. 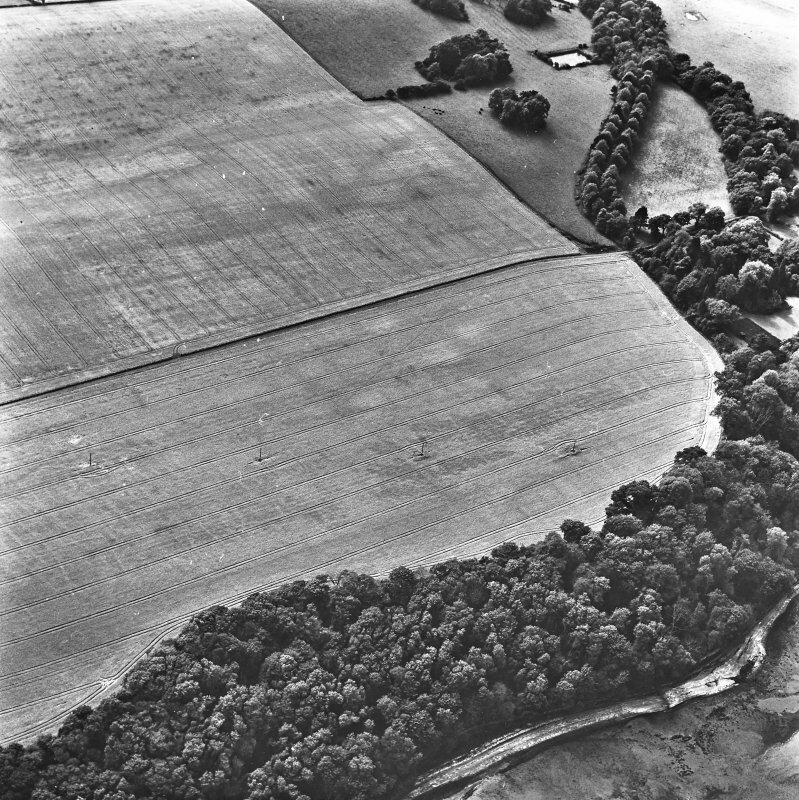 A search of the wood NE of Carriden yielded no information on this watercourse. 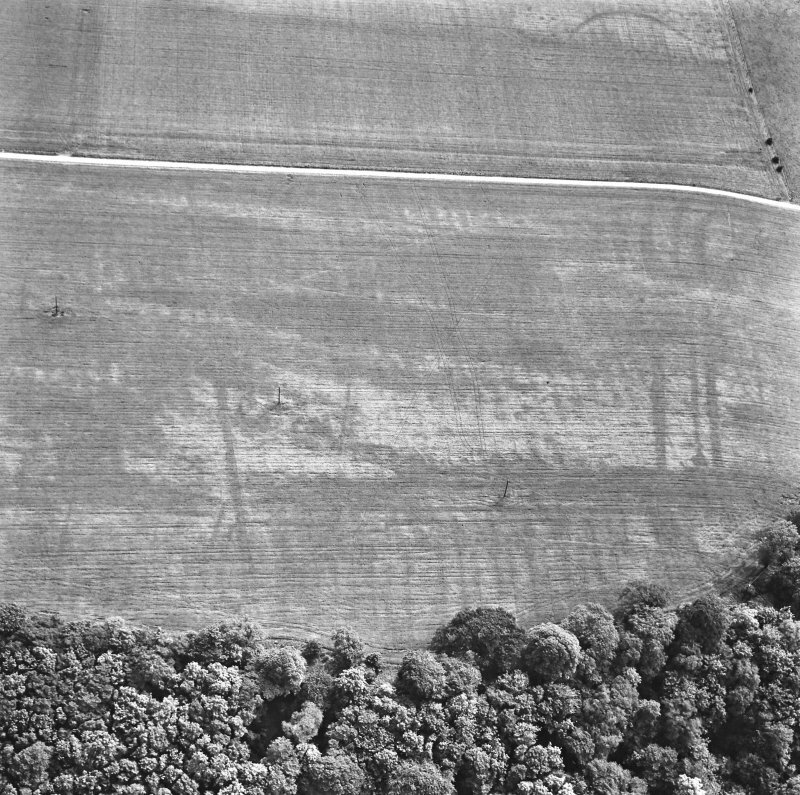 The extent of the fort is visible on St Joseph air photographs; there is nothing to be seen on the ground. 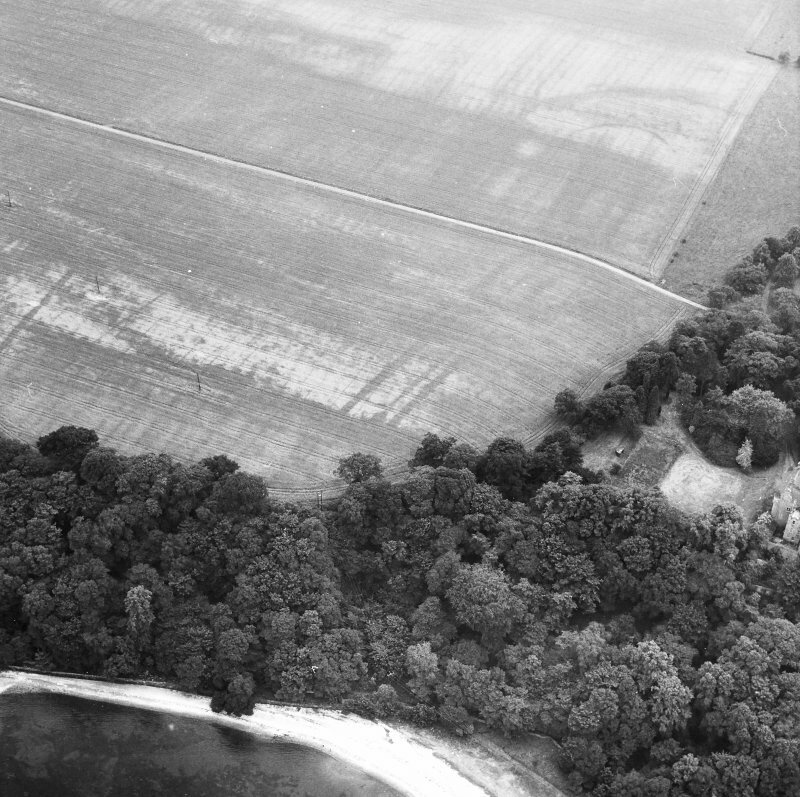 Site surveyed at 1:2500 from air photographs. Visited by OS (B S) 15 March 1974. 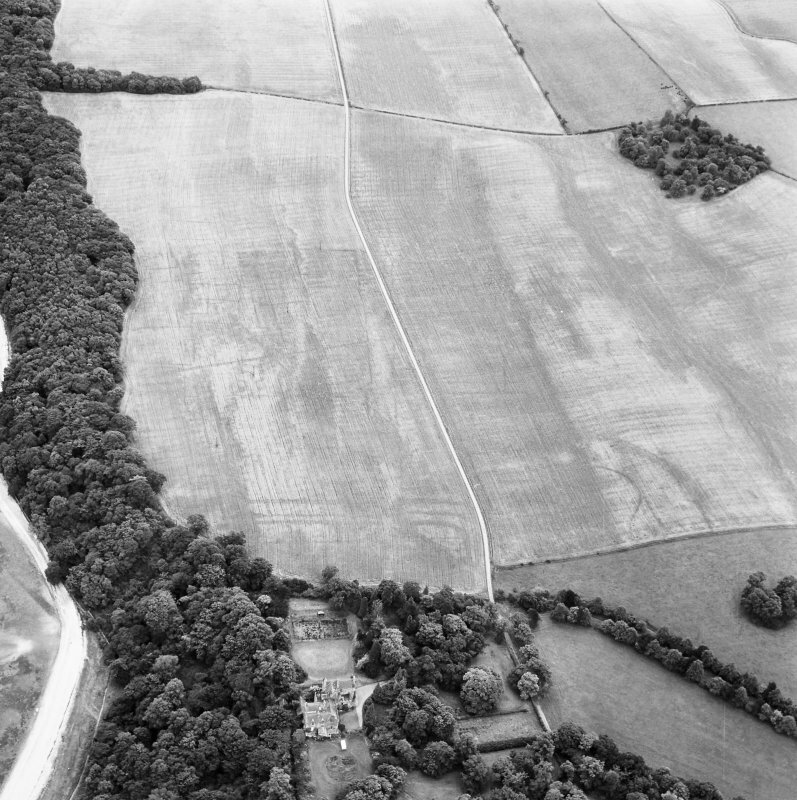 Large quantities of Roman pottery etc have been found within, and near to, this fort. E J Price 1974; Cumbernauld Hist Soc 1974; DES 1976. 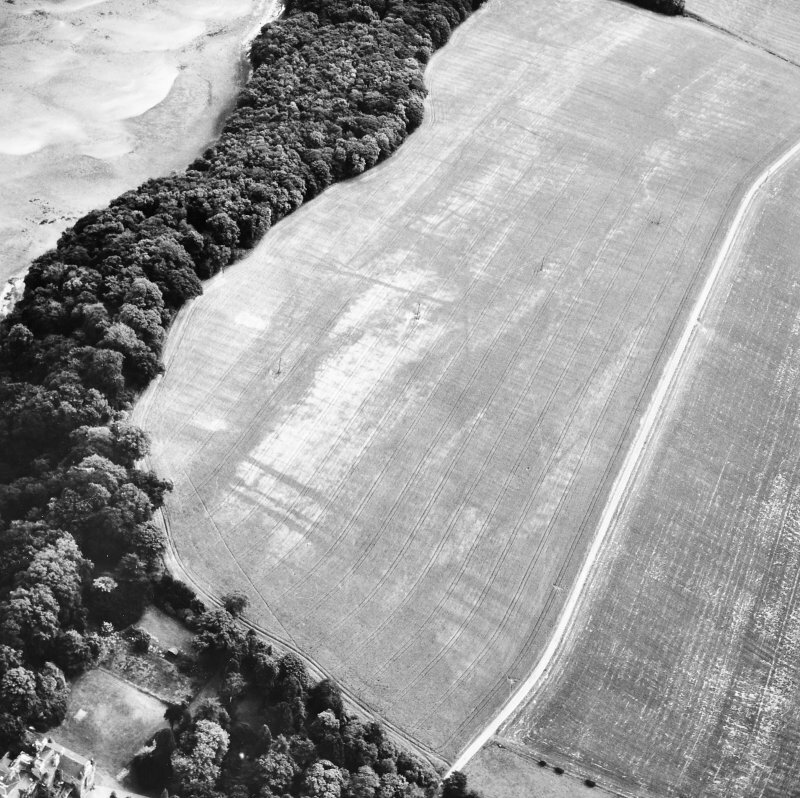 Air photographs of Carriden Roman fort, and the associated civil settlement, have been taken by the RCAHMS. 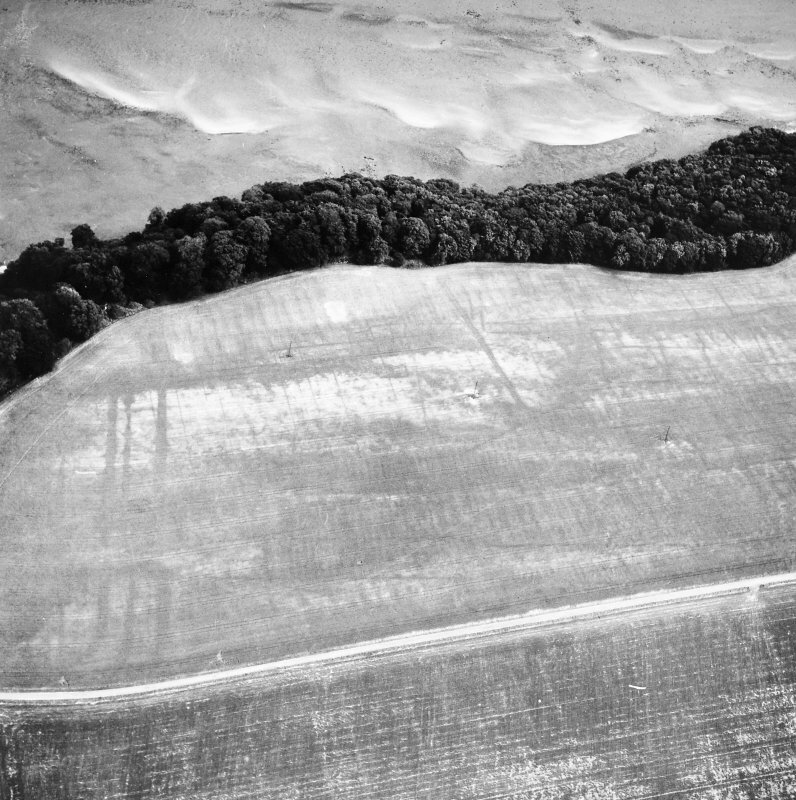 The RCAHMS and St Joseph APs (12,13) show the cropmarks of an extensive civil settlement to the east of the fort. 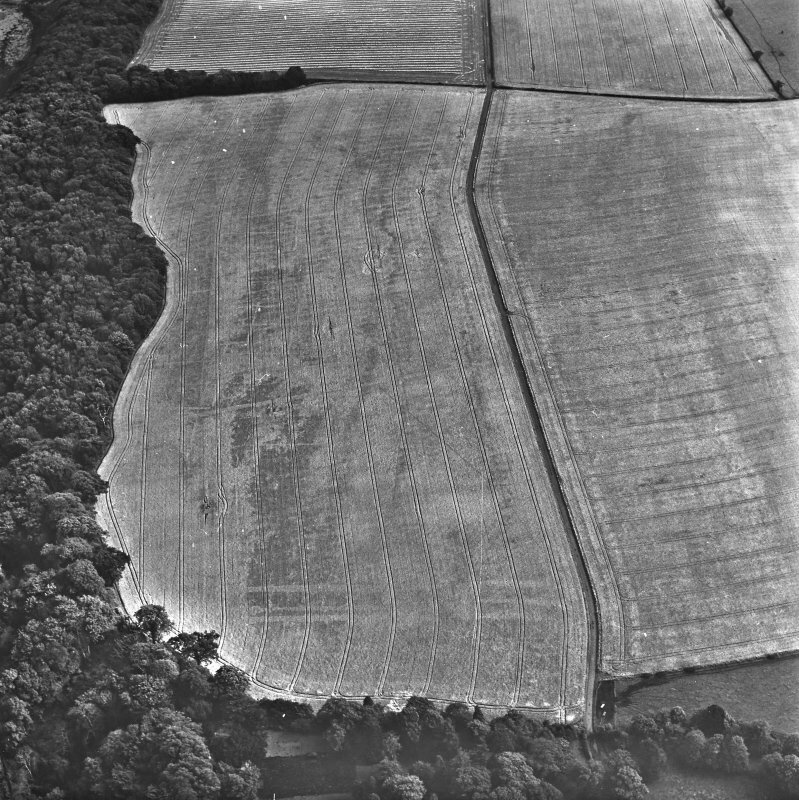 An area of approximately 6 hectares of linear and rectilinear ditch marks centred at NT 0280 8073 are visible in standing crop. The easterly extent of the settlement cannot be ascertained from either set of APs (12, 13). 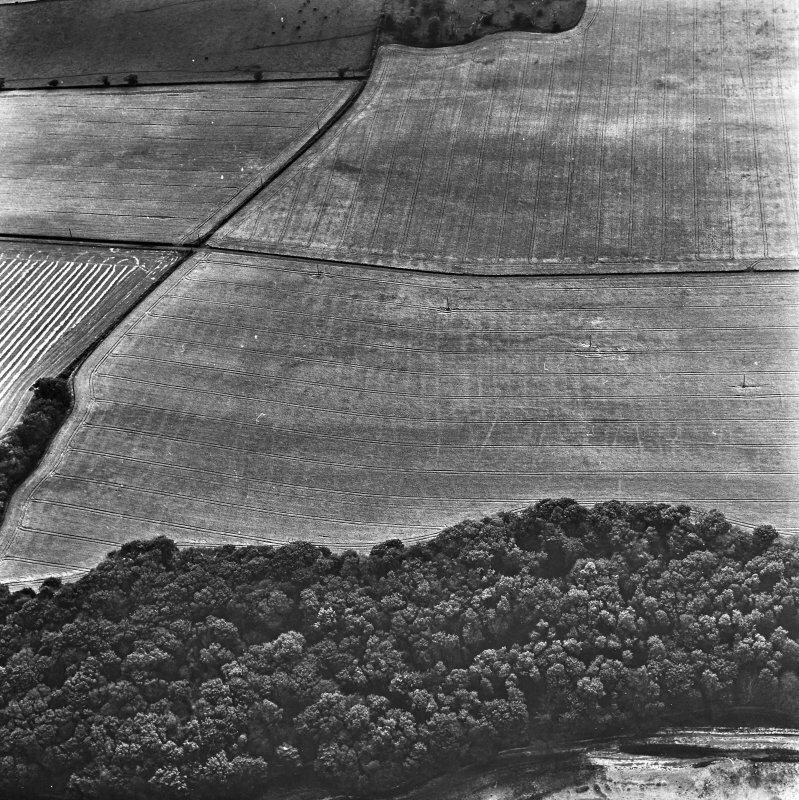 There are no coherent traces of the settlement in a pasture field of gentle and amorphous undulations. No finds were made, and its full extent could not be estimated. 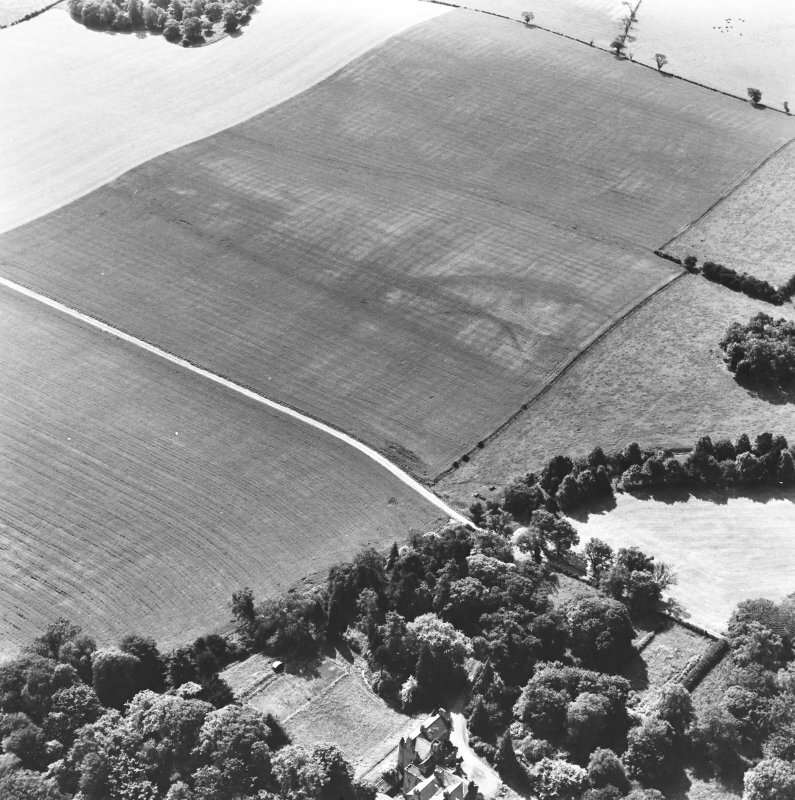 The field to the S (centred NT 927 805), under fresh plough, showed no surface trace of occupation. 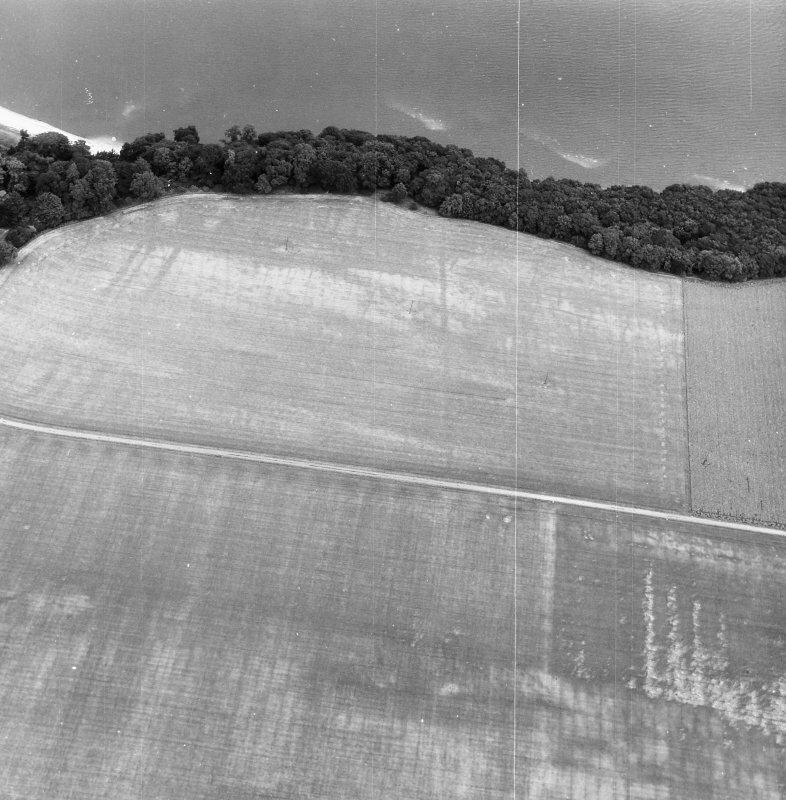 Fort re-surveyed at 1:2500 from air photographs. Visited by OS (J R L) 25 February 1980; Visible on J K St Joseph air photographs ADU 59, A 20 and A 21. Finds from Carriden, and many other places, donated to the NMAS by E J Price (1974) are listed under the general heading of-Roman and other material. 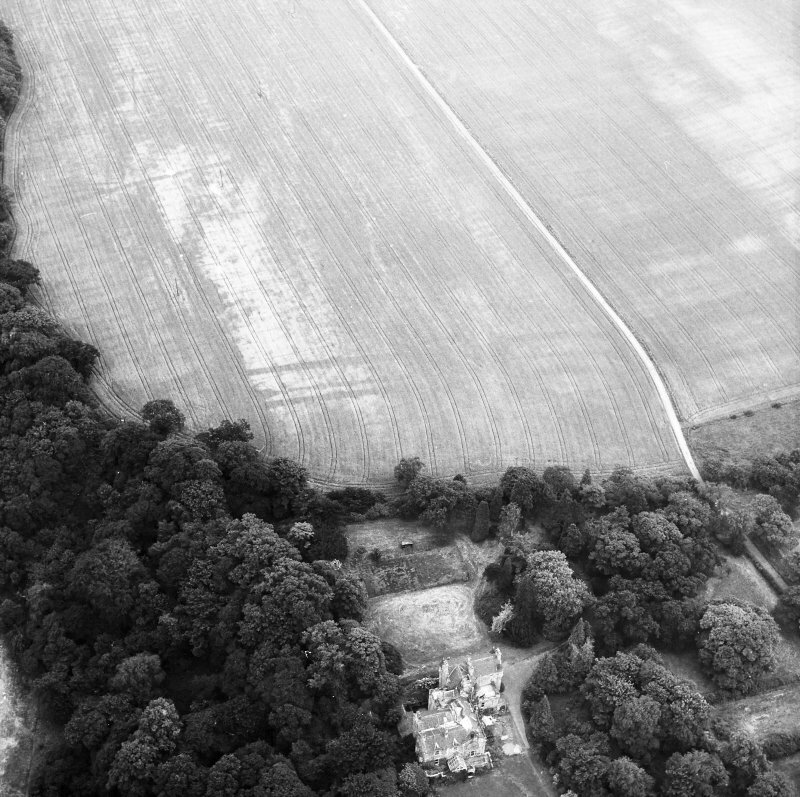 Additional aerial photographs by CUCAP and the RCAHM. 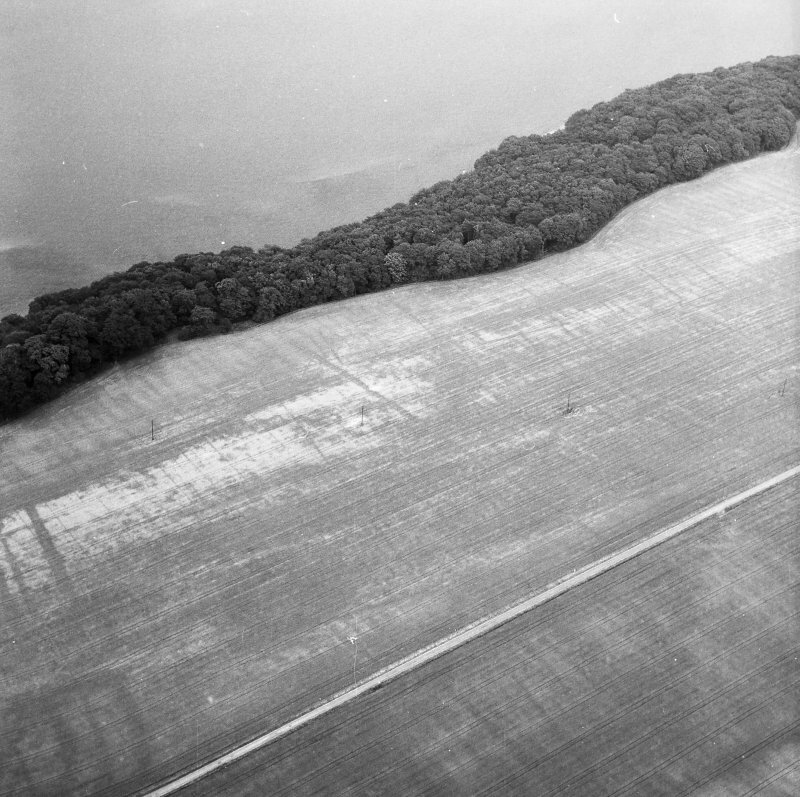 Visible on CUCAP air photographs A 19, A 22, D 19-20, L 30-1, U 42, BD 54; GN 36-7, MP 49-52, APS 24; Visible on RCAHMS air photographs WL 2006-11, flown 1979. NT 0245 8074. 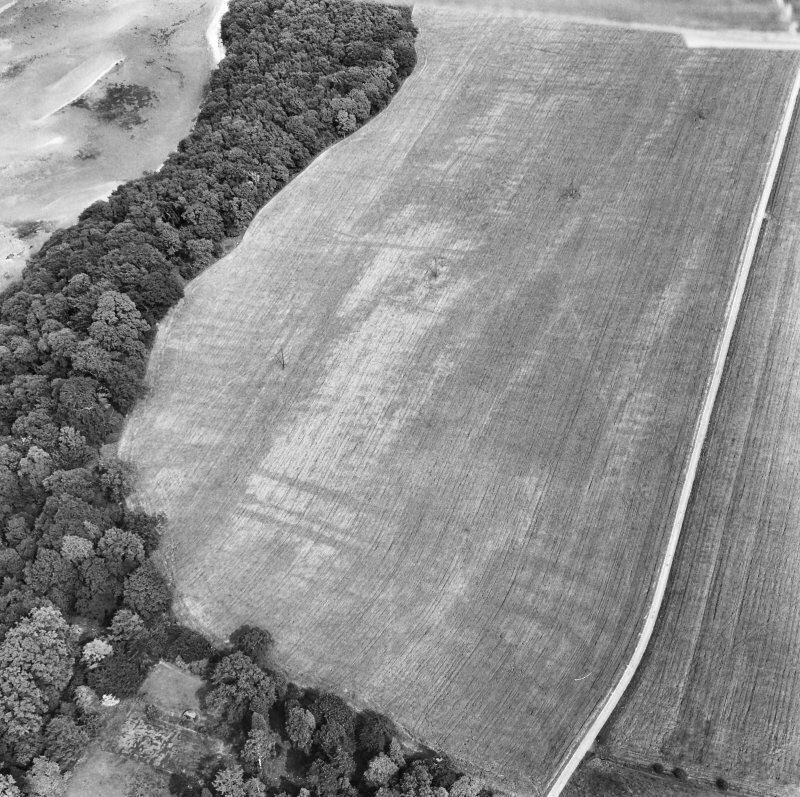 A two-week excavation to the W of the Roman fort at Carriden uncovered two defensive ditches demarcating the S side of an annexe. They were 3.4m apart: the inner measuring 2.6m wide and 1.0m deep; the outer 2.8m wide and 1.0m deep. 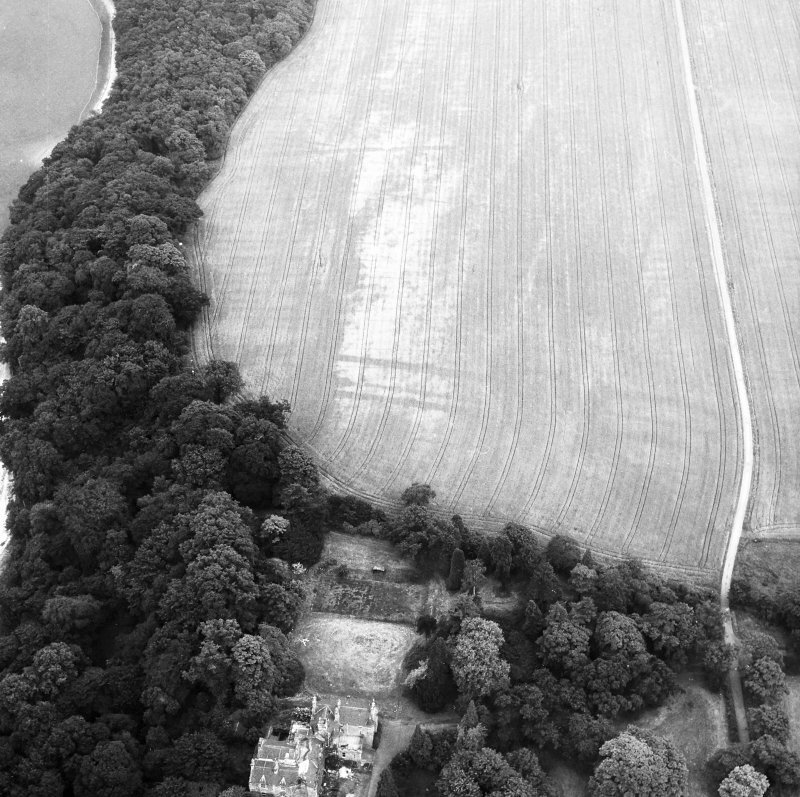 As it approached the SW corner of the fort ditches the inner annexe ditch terminated in an entrance causeway. The road through this was lightly metalled. A small blocking trench had been subsequently dug on the line of the ditch rendering the road obsolete. 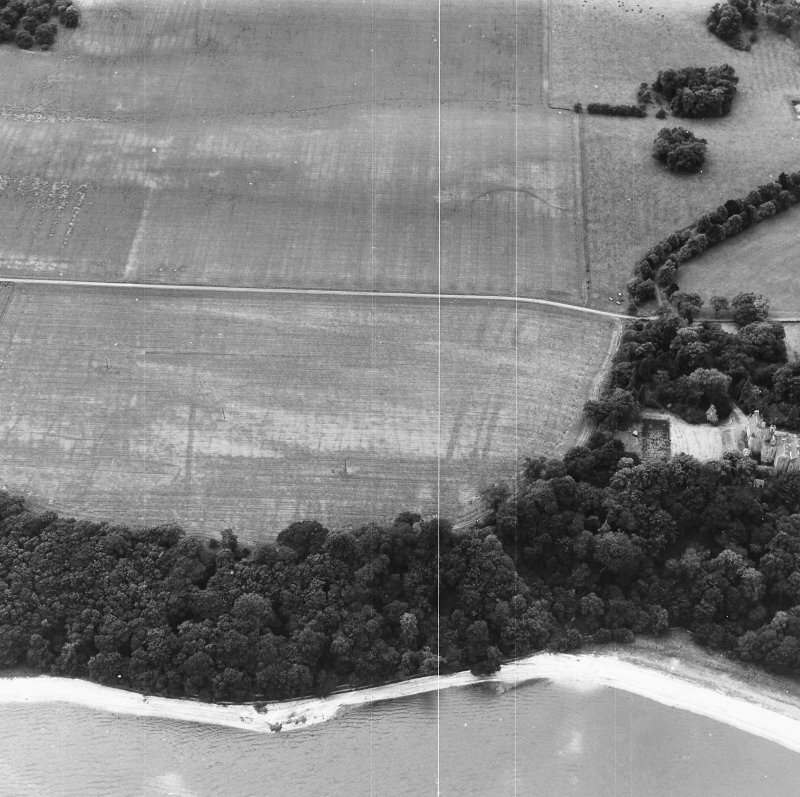 The fort is located partly in a field east of Carriden House and in Carriden House gardens c 80m from the coast edge on the top of the raised beach. 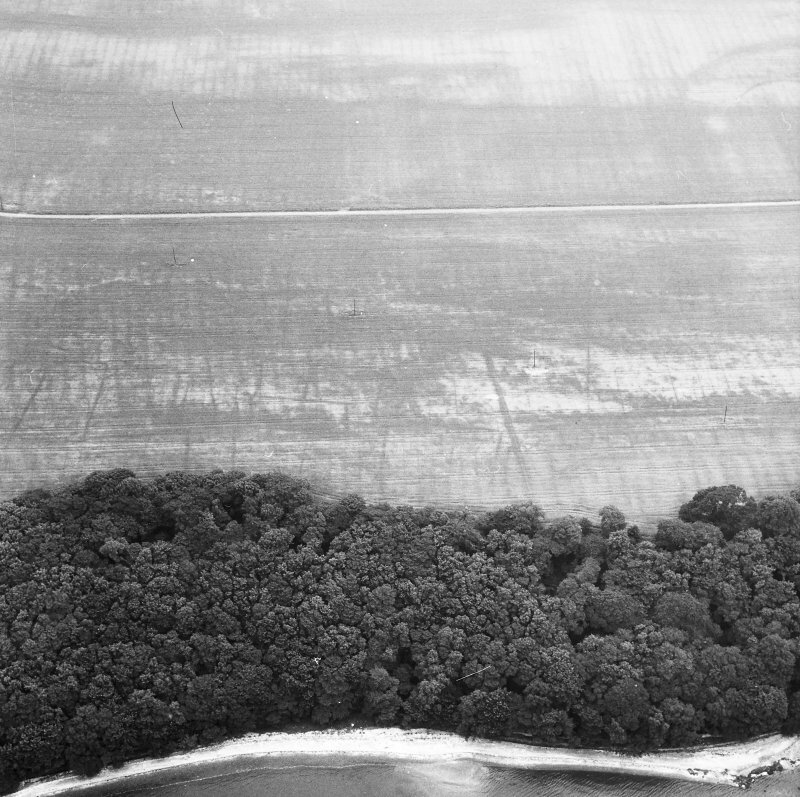 A fort was seen on aerial photographs in 1945. 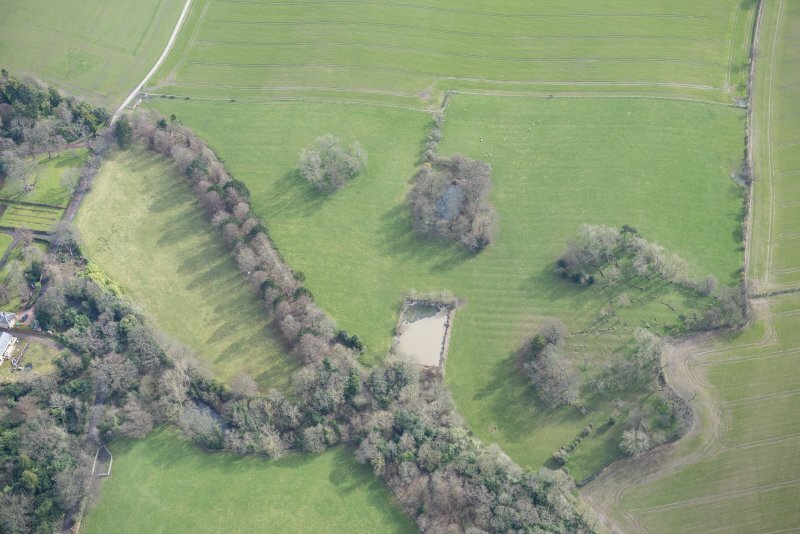 Trial trenches confirmed its presence and Roman pottery has been found here in the past. No remains are visible on the ground and the field is under cultivation. This site is not threatened by coastal erosion. NT 0255 8078 Magnetic survey to the E of the fort in October 2006 indicated useful detail, not visible on the air photographs, that may relate to civilian settlement. A structure with a ditch appeared immediately S of the fort. 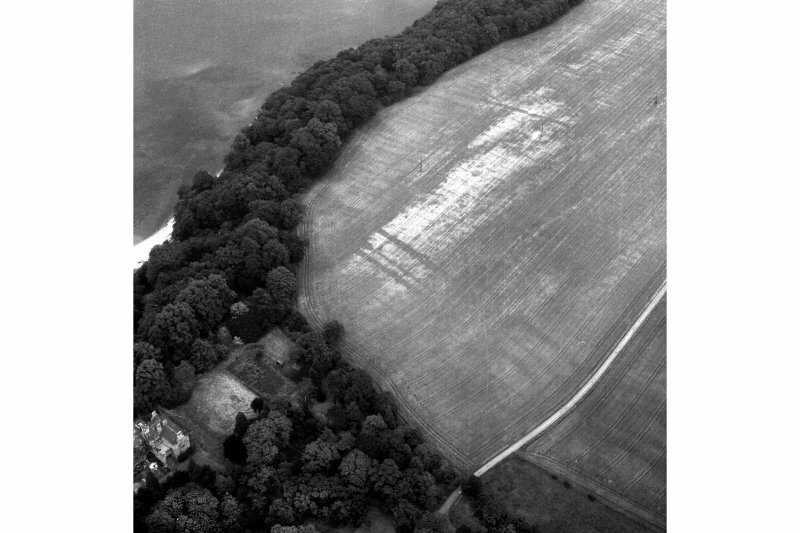 The survey also examined the area to the immediate W of the fort towards the Steadings. Interpretation is still in progress. Archive location not yet known. 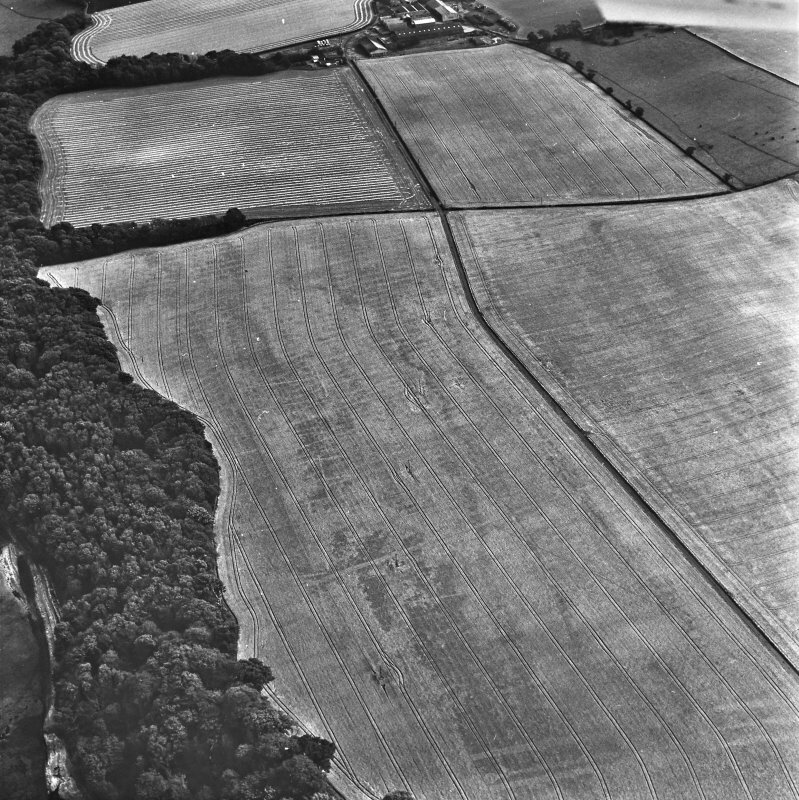 NT028 807 Limited excavations were undertaken in November 1991 within the field system believed to be the location of a vicus, to the E of Carriden Roman fort (NT08SW 7.00). 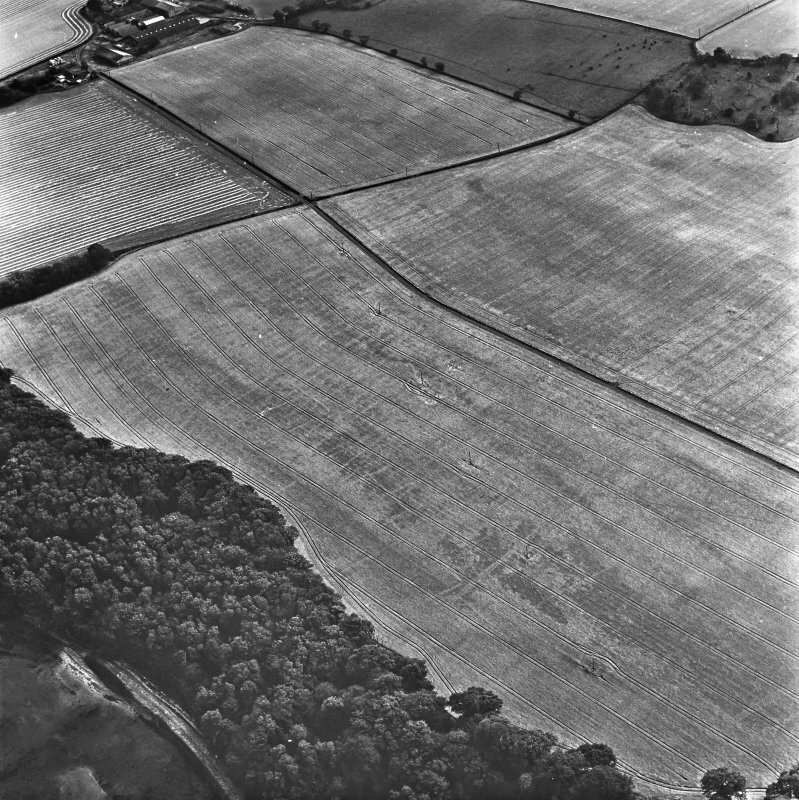 A complex field system is clearly visible on oblique aerial photographs. This system respects the alignment of a road issuing from the eastern side of the fort. 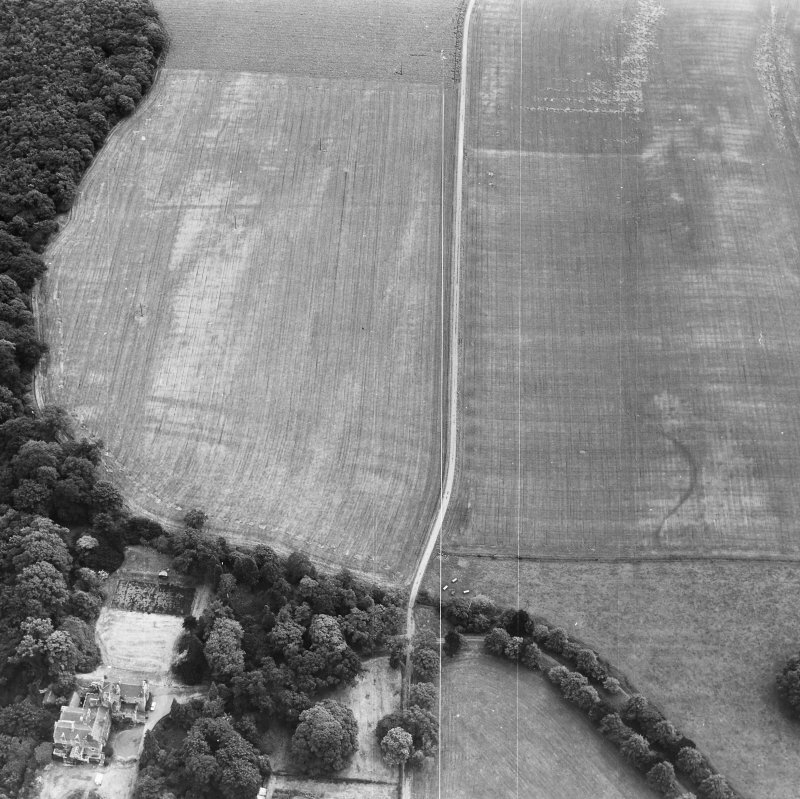 Six 2m by 2m trenches were excavated at standard intervals of 80m from NW (Trench 1) to SE (Trench 6), in advance of the replacement of an overhead power line. 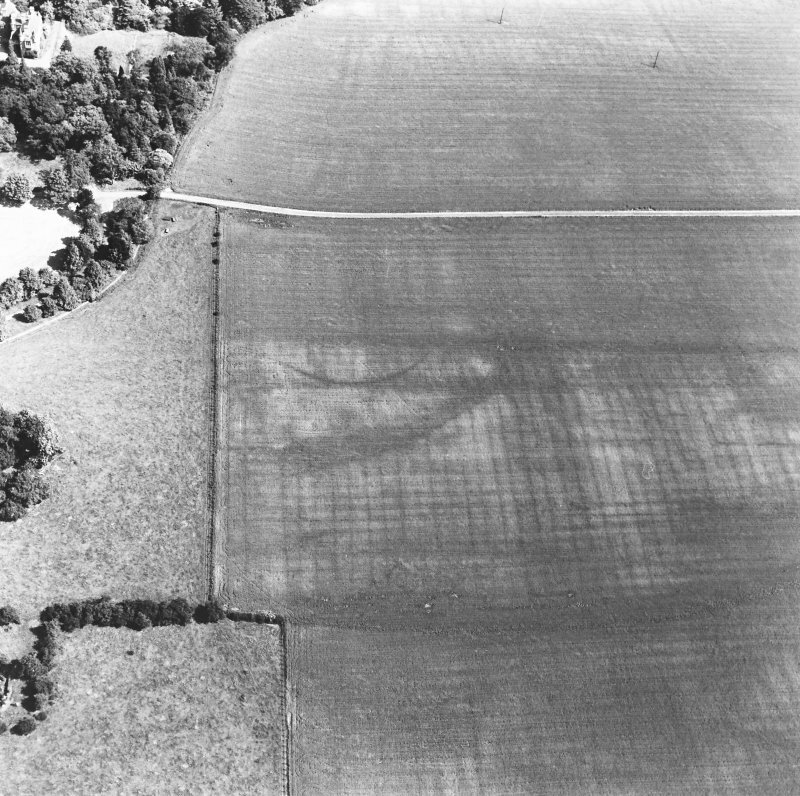 Only stratified ploughsoil survived above the level of the subsoil in each trench. A single definite Roman potsherd was recovered from the buried ploughsoil in Trench 3. 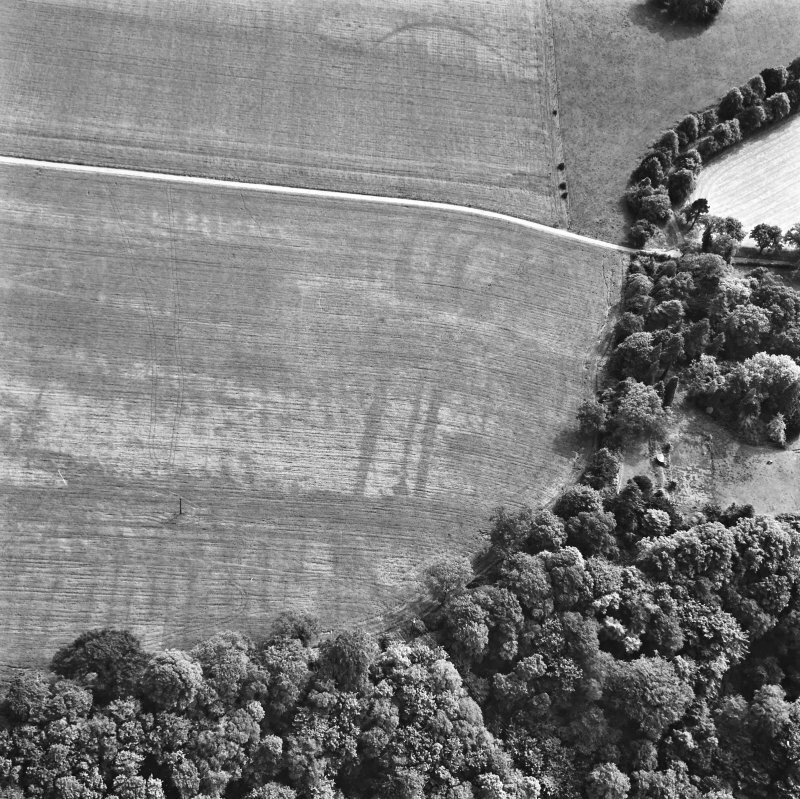 Ditches cut into the subsoil were located in three of the trenches examined (1, 3, 4). 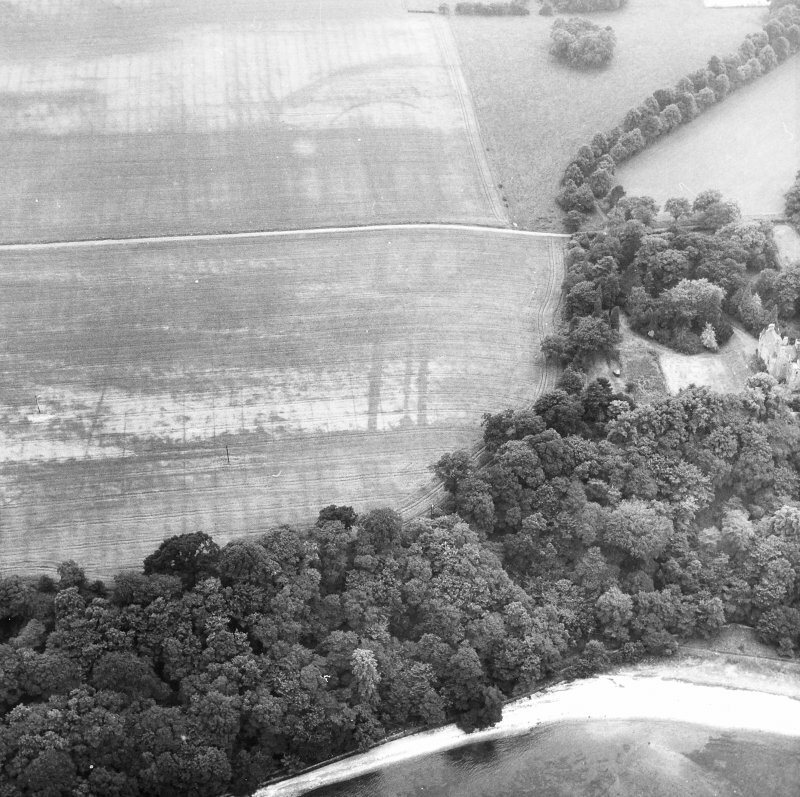 Each of these can be equated with reasonable certainty to features visible on aerial photographs. Two of these appear to be components of the field system (3, 4), whereas the third appears to be an intrusive secondary feature (1). Heavily truncated remains of stakeholes were found in trench 2. 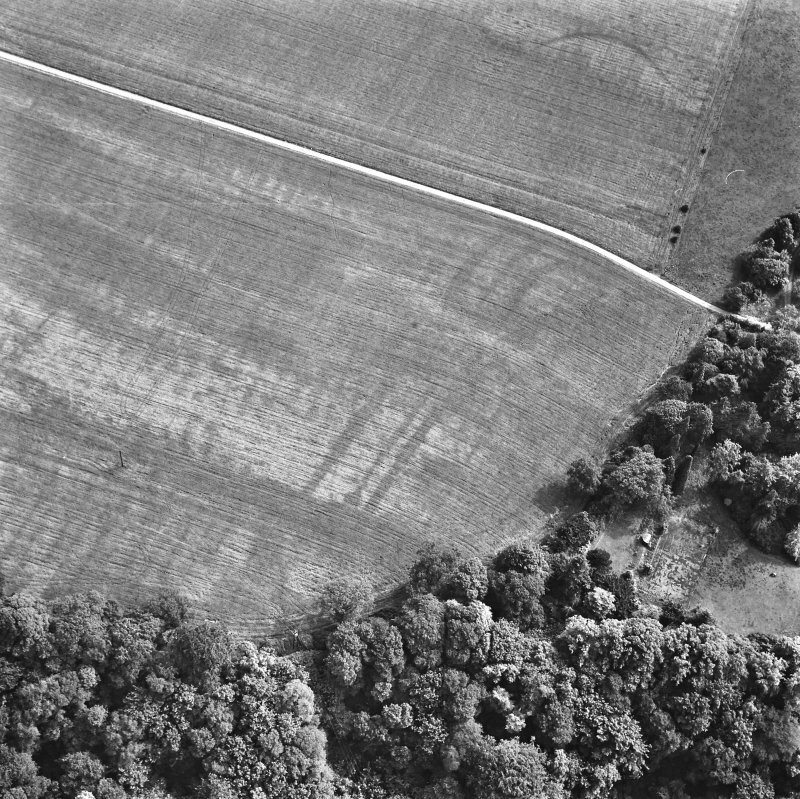 No archaeological features were encountered in trenches 5 and 6, which lie outside the area of the field system as defined by aerial photography. The excavations neither confirm nor deny a Roman origin for the field system. No artefacts were recovered in association with the stratified features. 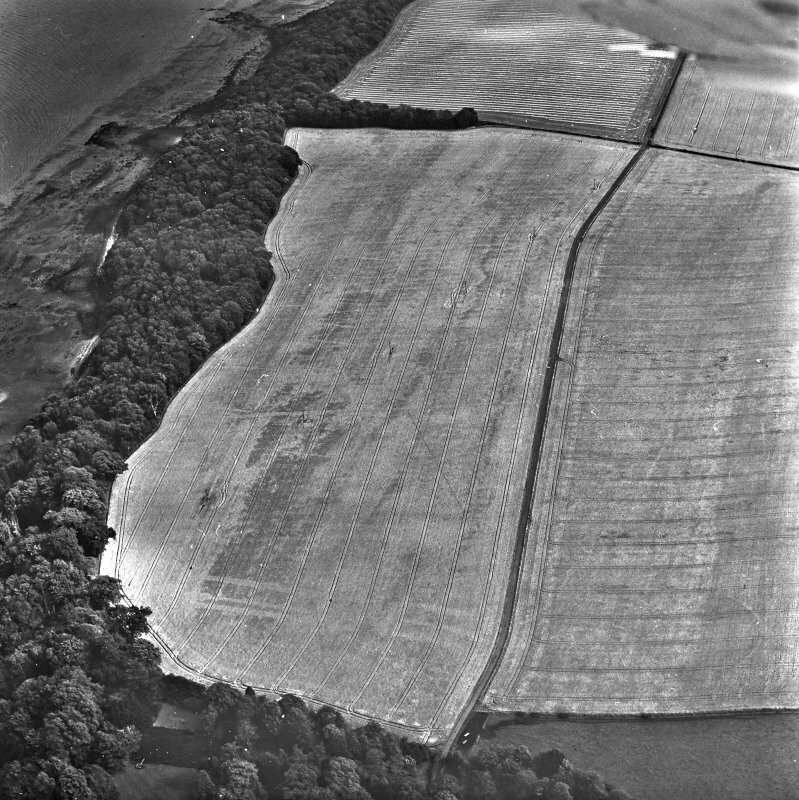 The field system is located to the east of Carriden Fort. The field has been recently ploughed and nothing is visible on the ground. Frontiers of the Roman Empire Project: Roman fort environs project. 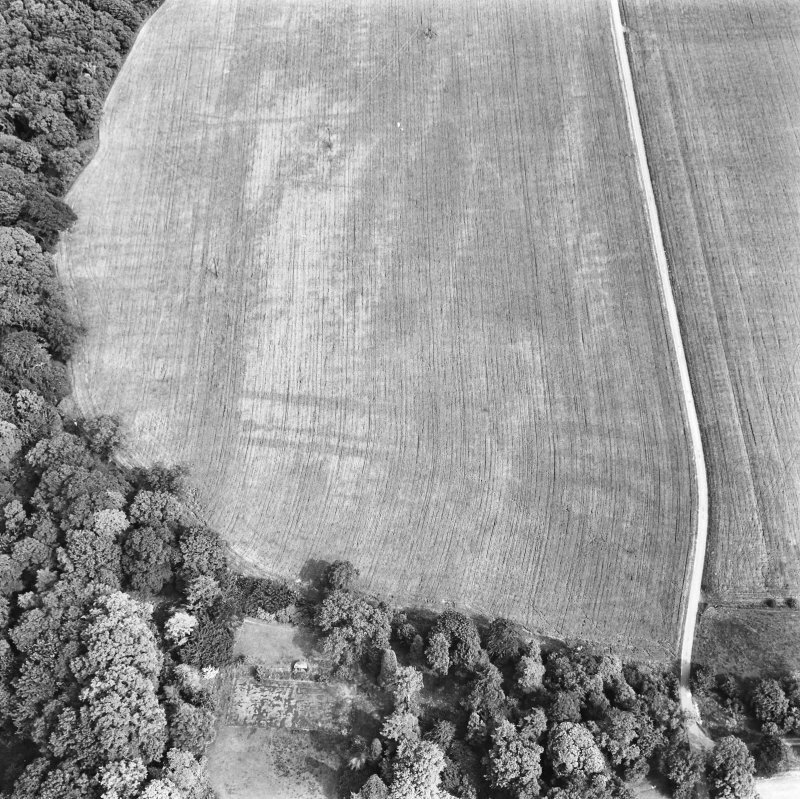 NT 0255 8078 The magnetic survey was undertaken in September 2007 in the large field E of the fort was continued (see DES 2006), covering an area of c12.5 ha. 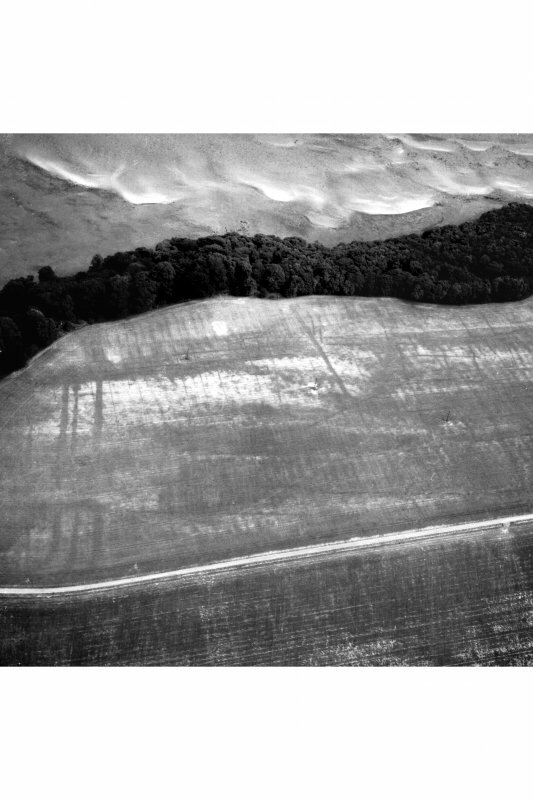 A smaller area to the S of this field was also surveyed. 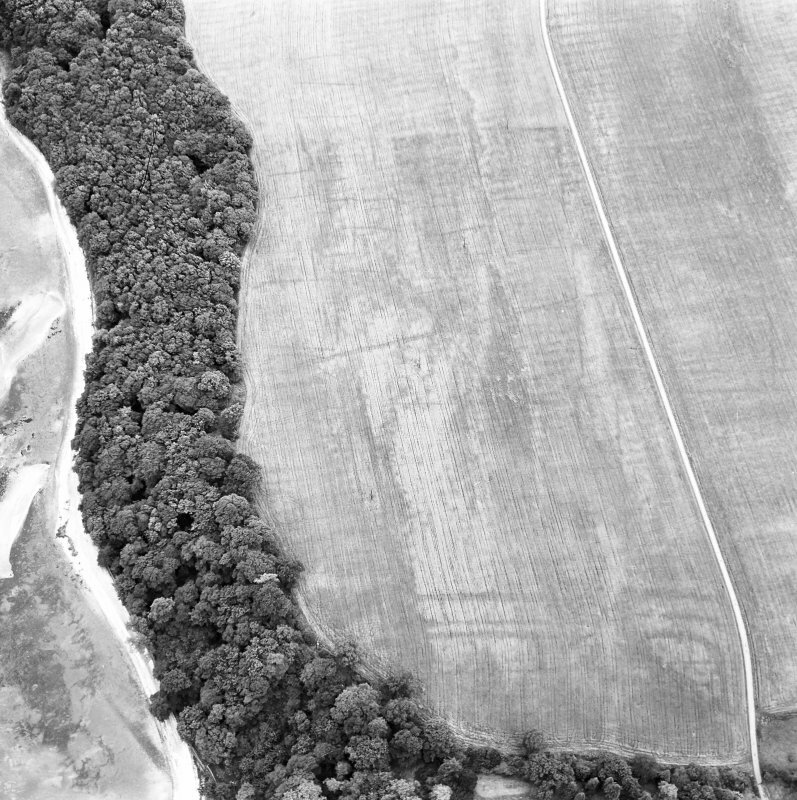 From a Roman perspective, the shallow ditch parallel to and c100m E from the fort's ditches and extending S as far as the road leading from the fort's E gate may be significant. Elsewhere, several phases of the remarkable field system and associated rig and furrow were identified, extending what has already emerged from aerial reconnaissance. 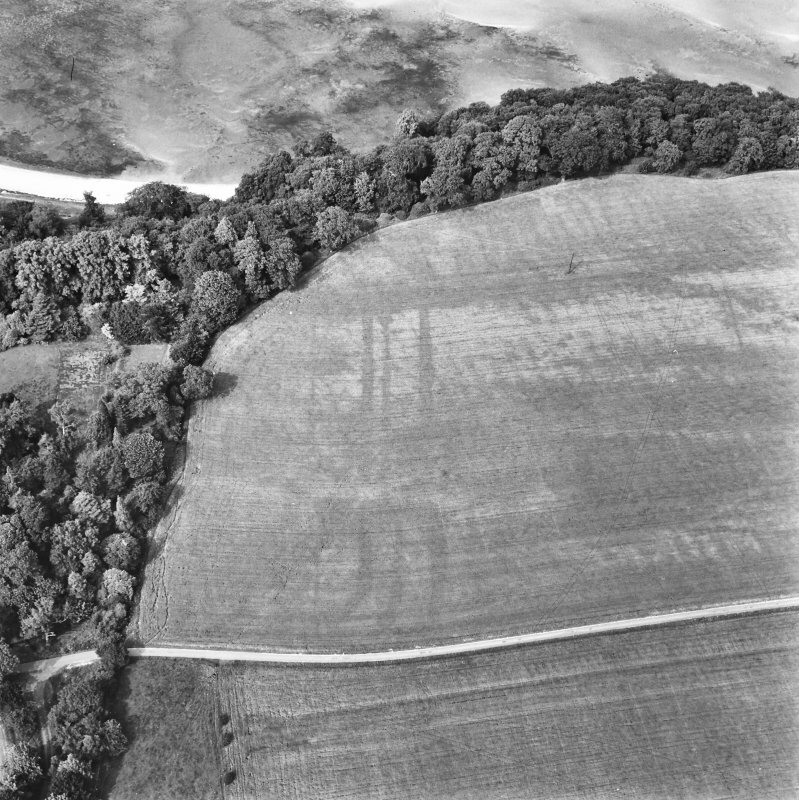 What appears to be a relict stream bed runs from the ditches of the Roman fort eastwards along the axis of the field. 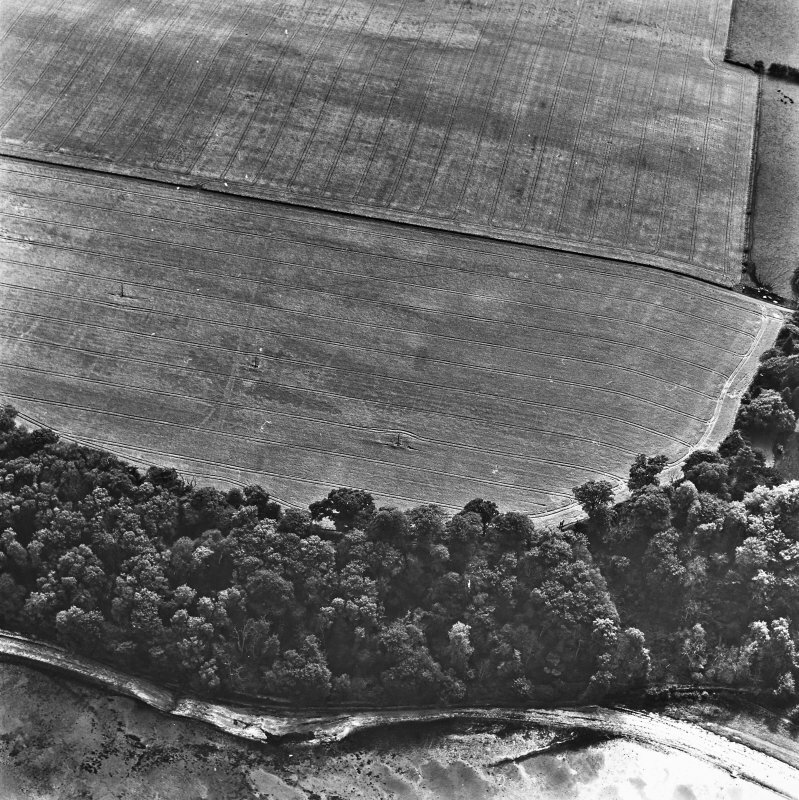 Nothing of the promontory fort at the east end of the field was detected. Archive location not yet decided. Funder: EU Culture 2000: Frontiers of the Roman Empire project. NT 0261 8073 Fieldwalking on 8 March 2008 over the ploughed fort site recovered 10 sherds of samian, 6 mortaria, 59 amphora and 24 other Roman wares. entrance was found next to the S gate of the fort. 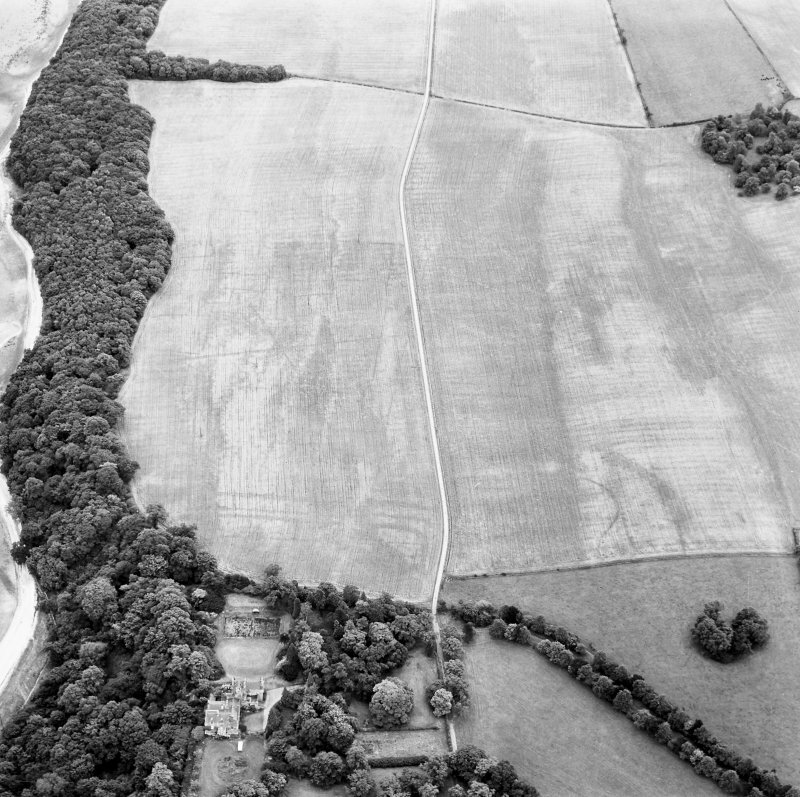 The ditch was subsequently filled in and replaced by a water leat or aqueduct. Traces of Roman occupation outside the annexe may have belonged to a vicus. Information from Historic Scotland, scheduling document dated 2 September 2011.